Een heerlijk compleet huis in een klein beveiligd resort. Mooi ingericht, luxe, compleet. Het huis geeft een gevoel van luxe, alles is er. Vlakbij zijn winkels en restaurants; Kruger en private resorts op goede reisafstand. Het contact met Anita & Gerrie verliep vriendelijk, alles was goed geregeld. Had a wonderful time at Anita and Gerrie's bushglam house. It was like staying in a 5 star hotel minus the hustle and bustle of hotel staff. A slice of paradise in the bush. We'll see you again soon Hoedspruit. My family and I had an absolutely wonderful stay at Bushglam, so much so that we had to ask to stay another day because we couldn't bear to leave! We absolutely loved the house and the furnishings make it something really special. The bathrooms are gorgeous and it was lovely to have such a huge shower - a real treat. The kitchen was also fabulous. The house is in a great area and we loved the Hat and Creek which was within walking distance, there is so much to do in the area so you'll never be bored. We loved Bushglam so much and would go back there in a heartbeat - I have recommended it to all my friends and family in SA and the UK. Anita and Gerrie seem very helpful and friendly and if you send an email, there is always a very prompt response.Thank you for a wonderful stay - I am hoping to return there one day as we had such a good time. Hello! Thanks a lot! I take the opportunity to say how we enjoyed our vacations in your home which is very comfortable and lovely decorated. We really love it. we'll recommend it with pleasure and already think about coming back for a next stay... Thanks again for your kindness. The house was great, the neighbourhood felt very safe, the communication beforehand was very easy and the information package we received before we arrived very helpful. We thoroughly enjoyed or week and we would always come back. If you intend to stay at a very quiet place this is probably not the place to stay since the bordering park gets pretty noisy with kids and families early in the day, but if you look for a modern clean house with pool that is next to nice restaurants and in a safe environment as a gateway to Kruger or the surrounding private game reserves this is definitely worth considering. We loved it at BushGlam. both of you and kind regards from sunny Switzerland. It's time for us to leave your stylish place :-(! you about some place to stay. Thanks again! Wij zijn weer veilig thuis. Geweldige weken gehad in Hoedspruit alles met de kinderen beleefd van Jessica de hippo, de reptielen, de boottocht en natuurlijk het Krugerpark. Het zwembad was een grote attractie wel tien keer per dag, de kinderen konden er geen genoeg van krijgen. Veel leuke restaurants waar we heerlijk gegeten hebben. Thank you very much - we thought bush glam was just perfect! Clean, well managed and gorgeous with everything we needed! Thank you very very much, we will be back. We had a wonderful time at BushGlam and we were sad to leave for home after the ten-day stay. The house is situated on the quiet edge of the tranquil Hoedspruit. Fine restaurants, nice shops and a little further a Spar supermarket are close by. We’ve found the house exactly as we’d seen on the internet site and it felt like home straight away. All descriptions and photo’s are accurate, so it’s not necessary to repeat this. The folder with house rules and things to do was very useful. We practically used it as a checklist and have done almost everything, never a dull moment and every activity was a great success. Once tired of all the activities we enjoyed the comfort of BushGlam, especially the large pool. The greater area around Hoedspruit is packed with beautiful scenery, wonderful areas to visit and joyful and interesting activities. Off course the safari opportunities are excellent with all the game reserves and parks all around Hoedspruit. We like to go somewhere else on every holiday, but we are not ready with South Africa and the Hoedspruit area yet. BushGlam has been a perfect home base and we certainly would like to return. We have spent five wonderful days at BushGlam. The house is beautiful furnished, very comfortable and we really felt at home! Hoedspruit has got nice shops and very nice restaurants, we especially enjoyed the food at The Hat and Creek. The morning game drive at the Thornybush Reserve was fantastic and really worth it getting up so early! Thank you for the wishes and really we loved our trip in Hoedspruit and all of your kindness. I hope see you in another trip to SA!!! We enjoyed our stay at BushGlam. The property is very neat and comfortable with everything close at hand. We will definitely go back during summertime to enjoy the pool and outdoors as well. Got back to work and straight into it. Thanks for everything and the Blyde river boat trip was great and will recommend to my friends as well as staying at Bushglam. Thanks so much for all your input towards our fantastic stay. The accommodation was fantastic. Very modern, clean and well maintained. I would highly recommend. We unfortunately didn't see any animals from the garden, but I am assured and seen photo evidence that animals do come. Anita & Gerrie have been fantastic and always helpful. I would definitely recommend. Thank you for a lovely stay. Our holiday unfortunately ends tomorrow. We will definitely recommend BushGlam to friends. BushGlam was our headquarters for one month during our two-month journey in South Africa. The house in Hoedspruit is very comfortable, nicely decorated, and well maintained, including maid, garden and pool service, and all the modern amenities. Lots of attention to details. The pictures on the website are exactly what you get. The pool is large and is appreciated after a long day of sightseeing. Double showers in both bathrooms were a nice luxury. Our first night we were surprised to see so much wildlife activity behind the electric fence in the backyard. We saw warthogs and guinea fowl in the afternoon and later in the evening some nyalla and magical fireflies. Beautiful outdoor furniture and lighting in the evening for a glass of South African wine while BBQing some game meat. The house is centrally located for day excursions. Quick trips to the Blyde River Canon for hiking, boating and beautiful afternoon drives. Two gates to Kruger are an hour or so away. We enjoyed wonderful drives to God's Window, the Pinnacle, the Potholes etc. A visit to the Endangered Species Centre is well worth the trip where we saw a rare King cheetah. The Moholoholo Wildlife Rehab Centre is also very interesting. There are lots of private game reserve to visit within half an hour to see the Big 5. Need a rest from touring, walk over to the Spa and pamper yourself with a relaxing massage or pedicure. Fifteen minutes’ drive, we had a magnificent hotair balloon ride where we saw lots of wildlife. We never ran out of things to do in the area. BushGlam has several excellent restaurants within walking distance. The Cala la Pasta Italian, Safari Club and the Hat and Creek restaurant have great food, excellent service and very reasonable prices. Five minute drive will bring you to the Railway Station Restaurant which has excellent food also. For the size of the town, there are lots of top notched restaurants and cafes to visit. Thanks Anita and Gerrie for sharing your beautiful house with us and making our trip easy and memorable. We will never forget your hospitality. Will definable be back! Na een verblijf in diverse landen in Zuid Afrika zijn we de laatste week neergestreken in BushGlam in Hoedspruit. Een schitterend huis voorzien van alle comfort en faciliteiten, ruime slaapkamers en twee badkamers. Een heerlijk en gezellig verblijf, zowel binnen als buiten. Heel centraal gelegen in een van de mooiste delen van Zuid Afrika, dichtbij het beroemde Krugerpark, de Blyde River Canyon en Panorama route. Snel en gemakkelijk bereikbaar vanuit Johannesburg. Kortom, een prima luxe uitvalbasis voor een ontspannen en bijzondere vakantie. Zeer aan te bevelen! We just wanted to say a big thank you for a lovely stay at BushGlam- you have a really lovely house and we had a great time there - our son loved your pool! In your area, we particularly enjoyed the Blyde River Cruise and loved The Cotton Club shops and garden, plus Debonairs pizzas were a big hit too! We really had a very enjoyable stay and we will recommend your establishment in the future. Wij hebben met onze drie kinderen (alle drie tieners) vijf dagen doorgebracht in het huis van Gerrie en Anita. Het was voor ons een ideale uitvalsbasis voor uitstapjes in de regio. Ons huis was in één woord prachtig. Zoals de foto’s op de website zijn weergegeven zo is het in werkelijkheid ook. Mooie slaapkamers en badkamers, een fijne keuken om te koken. We hebben heerlijk geslapen en lekker kunnen luieren in de tuin bij het zwembad. Maar ook de aanwezigheid van een wasmachine, strijkijzer, strijkplank en droogrekje is handig. Hoedspruit is een gezellig klein plaatsje met een aantal restaurants, een winkelcentrum met veel verschillende winkels, goede supermarkten tankstadions pin automaat etc. ’s Avonds zijn wij gewoon lopend van een restaurant naar huis gelopen en hebben onszelf geen moment onveilig gevoeld. De ochtend safari die we bij Gerrie en Anita geboekt hadden is zeker een aanrader. Zij gaan met de jeep ook van de onverharde wegen af de bush in om de dieren op te zoeken. Verder zijn er veel bezienswaardigheden in de regio. We kunnen terug kijken op een zeer geslaagde vakantie! I must confess that not all the glossy pictures on the websites for holiday accommodations turns out to be like that in real. BushGlam is one of those which what you see on the net is what you get, totally met expectations! I agree with all the reviews on the website. I totally had a wonderful time, only just that my stay was too short. 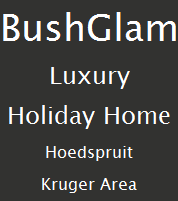 BushGlam will definitely be one of those I consider for my next holiday. Uit een gestrest Nederland kwamen we in Hoedspruit aan voor verblijf van een kleine week in het huis van Anita en Gerrie. Een huis met allure waar rust en romantiek uitstraalt. Wij voelden er ons direct thuis en het was zo ontspannend, dat wij onze energie snel terugkregen. De omgeving is fantastisch, leuke uitstapjes kunnen gemaakt worden en het is genieten van de natuur zowel dicht bij het huis, als ook een paar kilometer verderop in de privé-parken en het Krugerpark. Ook klein wild, zoals knobbelzwijnjes, hoenders en talrijke vogels, zijn in de achtertuin te bewonderen. Bij warm weer is het heerlijk toeven in het zwembad & bubbelbad. Dit alles onder het genot van een goed glas wijn. Het was een onvergetelijke vakantie en zeker de moeite waard om terug te komen. We enjoyed very much our stay in BushGlam, the location was perfect to visit both the Blyde River canyon and the Kruger. The accommodation was very nice and convenient. As the house is close to the village itself you will not only always hear those beautiful bush sounds. During the South African winter months the swimming pool turns quite cold because the nights cools it off quickly, although during daytime the weather is nice and warm with lots of sunshine. But again, we had a great stay, Bianca was very nice and helpful, and we would come again tomorrow if we could! We had a wonderful time at BushGlam – the house is lovely and had everything we could possibly have needed for our stay, thank you again. The pack with recommendations for things to do really helped – particularly when it started raining! Hopefully one day we’ll be able to return and will definitely be in touch if we do! We are not home yet but are enjoying one more night just outside Hazyview. Your home is fantastic and I have to say attention to detail cannot be faulted, it was like a home away from home. We had a great week and are sad to leave Hoedspruit and BushGlam. The restaurants were great as we tried a few (best was Cala la Pasta) and we had a few birds which we fed at the fence each night, amazing. Unfortunately we did not see any game at the fence. Once again I have to say a lovely comfortable home and a good relaxed week, thank you. We have really enjoyed a carefree holiday in BushGlam, in this beautiful spacious house with pool in Hoedspruit. It had been perfectly arranged by Lobecotours: flight suggestions, advice for hotel for the first night, even the car including advice on automatic. Once at the destination place we were impressed by the quality and cleanliness of the house, the space, the contemporary décor, the luxurious swimming pool and terrace at ‘the bush’. The safari drives (a must!) and cruise were booked for us. We also received good restaurant tips and valuable suggestions for other special ‘things to do’. In short, it was bountiful top quality! Very professional and recommendable! BushGlam was voor ons een geweldige ervaring. Onbekend gingen wij naar het noorden van Zuid Afrika, om te gaan genieten van de natuur en natuurlijk de game-drives. BushGlam maakt ook een onderdeel uit van het fijne gevoel dat je kunt beleven, niet alleen wat de natuur te bieden heeft, maar ook de gezelligheid en warmte wat dit huis met het zwembad uitstraalt. Wij voelden ons daar heel gelukkig! Het huis heeft een smaakvolle, goed verzorgde inrichting. Wij zijn echte Bourgondiërs maar wilden 's-avonds bij het zwembad zitten i.p.v. bezoek aan restaurant, om te genieten van de geluiden die de nachtelijke omgeving bood. Er zijn zoveel mogelijkheden dat alles niet in 1 week kan worden uitgevoerd, zodat een volgend bezoek aan dit geweldige huis, zeker zal plaatsvinden! Bedankt, alles was prima verzorgd!! Thanks for the really super furnished house! The boys have full on enjoyed the pool and the surrounding area. We made an afternoon/evening safari drive and saw a lot including the big4, the elephant not…for this time! We had a terrific stay in Hoedspruit at BushGlam in December 2012. The house was perfect for the four of us. Plenty of room, nice swimming pool and the air conditioning was a relief on a couple of hot nights. Highlights of our time around Hoedspruit included several activities suggested by Anita and Gerrie: Two visits to Hoedspruit Endangered Species Center (the young Cheetahs were great), kisses from Jessica the hippo, and a couple of self guided trips into Kruger Park. The house was conveniently located near these activities and several nice restaurants are within walking distance, with many other restaurants and two supermarket stores located a short drive away. Colleen (the local manager) and Anita and Gerrie also went above and beyond in helping track a package to us that had vanished into the South African postal system – they delivered it to us personally (!) in the Cape Town area before we left South Africa. Thanks again for all your help. You get in the house and it feels like home! This is what we want from self-catering. Clear explanation about the house from Colleen and we can start enjoying. From the tips from Gerrie and Anita we booked for 2 game-drives and the boot cruise. All 3 where better than expected! So it is worth it to book and look carefully at the tips, something for everybody! The 7 days we stayed, we relaxed, had nice drives, saw a lot of animals (also in the backyard), swam in the beautiful pool, dreamed away in the jet streamer, had good en lovely dinners in town (Hat & Greek was our favorite) and had good quality time as a family. WE DO IT AGAIN! We returned from Hoedspruit yesterday, as arranged with you, after a terrific stay in your home. Thank you so much, we really enjoyed being there, loved Hoedspruit and its weather and sampling the local cuisine at the various restaurants in Hoedspruit. You really have a lovely place there and I would certainly like to make use of the facility again sometime in the future. It is most conveniently situated - and close to the Kruger Park which we visited on the public holiday. Also most enjoyable. We really had a wonderful five days in your home. You have thought of absolutely everything regarding self-catering accommodation and besides that your home is comfortable, homely and very conveniently placed. Definitely accommodation to be recommended.  Colleen was very helpful and friendly and was always ready to assist. All in all it was a most enjoyable stay. Thank you so much. We stayed at Bush Glam for 5 days and had a really wonderful time. The house is modern with a large master bedroom en suite and private balcony overlooking the bush. Bush Glam is centrally situated and within walking distance to restaurants. We had an amazing time in beautiful surroundings and can recommend this ccommodation. Na een lange tocht door de prachtige bergen zijn we aangekomen in het kleine plaatsje Hoedspruit. We werden zeer aangenaam verrast door het prachtige huis met zwembad en jet streamer. Na de rondleiding door het huis werden we ook nog verwelkomd door een groep Nyala's bij het hek van de achtertuin! Hoedspruit ligt redelijk dichtbij 2 toegangen tot het Krugerpark en dichtbij diverse private game resorts. we hebben dus heel veel wild van dichtbij kunnen bewonderen. Met name de game drives die Anita en Gerrie voor ons hadden georganiseerd, waren spectaculair! Neushoorns, olifanten en zelfs een leeuw midden in de Bush heel dichtbij gezien. Maar er is meer te beleven: de blyde rivier canyon en de vele prachtige watervallen. En s avonds lekker bijkomen en nagenieten in de achtertuin..
Hoedspruit is een klein dorpje, maar wel van alle gemakken voorzien: curio shops, diverse goede restaurants en zelfs een afhaal pizzeria. Het restaurant hat en creek was wel ons favoriet. Gerrie en Anita, hartelijk bedankt voor deze fantastische en bijzondere ervaring vanuit de bushglam! We were really curious to see BushGlam in reality after all information and pictures we saw. Our expectations were high, but totally blown away when we saw the reality; BushGlam feels like home, a place to unwind and relax! The furniture and decoration of BushGlam are of high quality, tasteful, modern with an African touch. Of course we used the pool every day, no better way to start your day in Hoedspruit. Hoedspruit itself is a nice village which meets everybody’s needs. We discovered quite some good restaurants, ‘Hat and Creek’ and ‘Safari Club’ were our favorites, although we did not had the time to discover ’Ollie’s’, which is also in walking distance of BushGlam. On a certain day it was raining cats and dogs and we decided to go back to the house earlier; and there they were standing, at least six Kudu’s, just at the end of our backyard, hiding for the rain, just a few meters away … incredible! We really loved our stay, we have been very active, seen a lot, even the big 5 (of the 6), thanks also for organizing this safari experience for us! Just a week in BushGlam and Hoedspruit is too short, as it has a lot to offer; so much luxury and comfort, safe, wildlife at your doorstep but also restaurants and shops close by. For us (and we are quite spoiled travelers) it was a welcome surprise to experience BushGlam! Thanks, Anita and Gerrie you really made our holiday even more special.